This soccer drill is a great way to warm up and develop a healthy appetite for competition. Set up a small circular zone where the players will need to dribble within. It’s important for players to look up and maintain close ball control whilst trying to avoid their teammates. 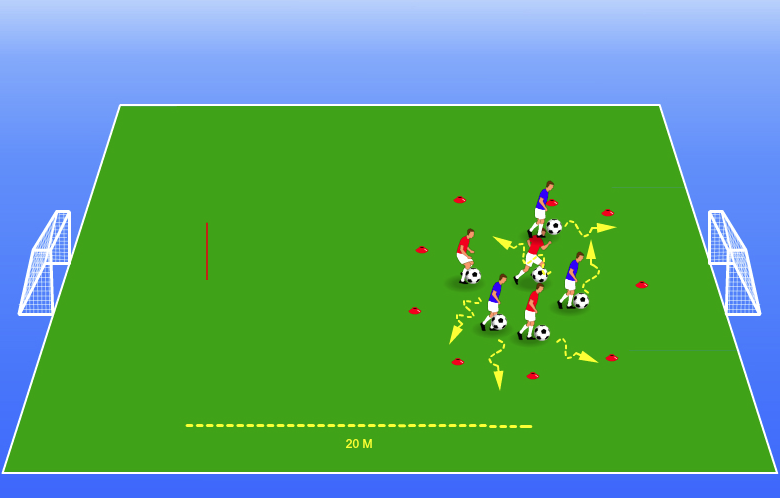 As players dribble amongst each other, place a flag approximately 20 metres away. On the whistle, players must leave their ball and sprint around the flag and back to their original ball. On returning to the balls, the players must pick up their own ball. Practice this drill a couple of times so the players get the hang of the drill. Now here’s the fun part, just like musical chairs. Once the players understand the drill, repeat the drill but eliminate one ball from the circular zone whilst the players are running around the flag. The player that misses out on a ball is eliminated from the drill. Continue the drill until you have a winner.